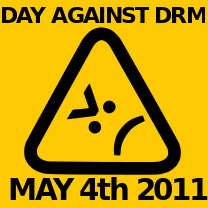 Today is the 2011 Day Against DRM. I stand firmly against digital rights management of any kind. As stated in the eBooks Bill of Rights I co-authored with Andy Woodworth, “Digital Rights Management (DRM), like a tariff, acts as a mechanism to inhibit this free exchange of ideas, literature, and information.” That is not acceptable to me. There are arguments to made for some kind of ideal future with lightweight and invisible DRM, but I do not agree with them. DRM is bad. Period. As a librarian, I cannot in good conscience endorse spending library funds on content laden with DRM. It is not a sound investment for the long-term, and it supports and sustains a business model of proprietary control that I do not agree with. As a librarian, I believe in free access to information and the right and responsibility of libraries to preserve the cultural record. DRM prevents that. DRM prevents fair use, the ability to purchase and give away/resell content you’ve purchased, back-ups, and control over content you purchased. DRM takes the control of the content or device’s functionality away from the owner–forcing compliance with a company’s preferences through sheer brute force. DRM treats you, the person who bought the content, as a de facto criminal. You can’t use the content you legally and rightfully purchased or licensed in the way that is consistent with private property rights. DRM is also crazy expensive to develop and maintain — so every time you buy a piece of content with DRM on it (say an Overdrive eAudioBook or an AAC music file from iTunes), part of that money is going toward the development of software that restricts your rights to use that very piece of content you just bought. Just think how many more books we could buy for our libraries if we weren’t paying out the nose for companies to develop DRM to “protect” them from their rightful owners. The Day Against DRM is celebrated internationally, and you can follow what’s going on via the Twitter hashtag #nodrm. A lot is also being posted to blogs, traditional media sites, etc. If you’re looking for things to do to announce your solidarity against digital rights management, look to Defective by Design (lots of ideas). The organization puts out a lot of information, flyers, images, and posters for organizations to use to educate people about digital rights management and its effect on their privacy and freedom of information access. Here is a particularly good half-sheet leaflet explaining what DRM is and why it’s bad. * Stop financing the people who restrict information access. Don’t buy DRM-encoded content and products, like Blu-ray, iTunes music in AAC format, Windows Media Player, Amazon Kindle eBooks, Apple iBooks, and many more. Don’t buy from retailers who insist on DRM as part of their content or devices. * Promote collections of open access and DRM-free content at your library. * Support and participate in open projects like Project Gutenberg and the ever-amazing OpenLibrary, an Internet Archive project to build a complete library of digital content. * Tell our digital content providers (like Overdrive or ProQuest) that we don’t want DRM on our library eBooks — that it gravely damages the user’s experience and our image as a digital content provider. * You can buy a shirt like mine that says “Librarians Against DRM” (which I am proudly wearing today at my library). I’ve gotten 7 questions so far from users about its meaning. * Which leads me to the last item: educate your users about digital rights management — both on library items and on the items they are buying as consumers. What does DRM do? What are the legal issues involved? How can they advocate for change? Digital rights management, and digital content overall, are issues of primary importance to libraries today. It is our job to educate our communities about what is happening to their digital rights, and what they (and we) can do to promote continued open access to information. After all, that’s what a library is all about. Just a slight quibble, but I think iTunes music has been entirely DRM-free since early 2009. Thanks for the DRM lesson and handout!